Village head of Bhalwa village Mohd Imran said that the 66 families have not yet enrolled in voters list from their new place of residence. 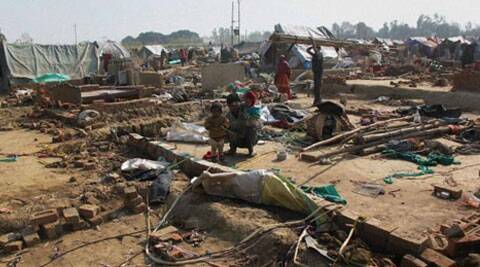 Members of 66 displaced families belonging to three of the riot-hit villages have decided not to cast their votes in the Lok Sabha election, saying they have lost faith in political leaders. The families had fled their villages Lank, Sisauli and Bitawda in the district during the communal violence that left over 60 dead in September last year and took refuge in another village Bhalwa. Villagers there have now built some houses for them. “We have lost confidence in political leaders. They failed to provide help and gave only assurances after the riots,” Ahsan, a riot victim, said. Others like Maherban, Iliyas and Mukhiya too said they would not go to their native villages with their families to cast their votes.